Playing steel pans (steel drums) is fun! Start by learning correct steel pan technique. The circular shape of the instrument makes it unique in appearance but also provides the player with challenges. The following techniques will help in developing speed and eveness of sound. 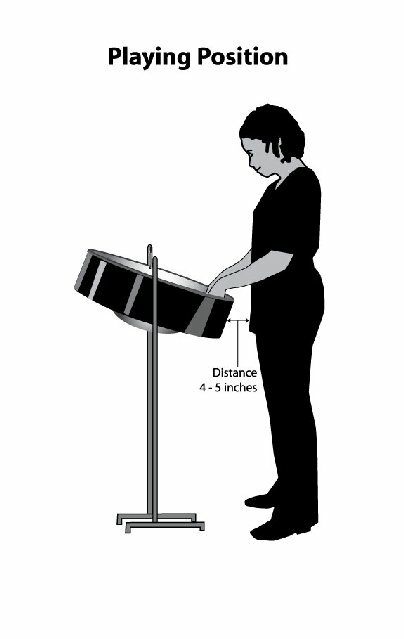 Stand directly in front of the instrument leaving approximately 4-5 inches between the body and the skirt of the pan. Distribute your body weight evenly between your feet. Keep your hands close to the playing surface at all times. This is essential if you are to play accurately and with speed. Keep your elbows at or a little above waist level. Avoid shuffling your feet from side to side while playing. If there is difficulty accessing a note, keep the feet firmly planted on the ground and pivot slightly from the waist towards the note. Lean slightly into the instrument if necessary. Bending into the instrument is accepted steel pan technique. Playing background pans requires more agility from the performer as there are more and larger pans than in the frontline and mid-range sections. Pans in the background and mid-range sections are usually arranged in horse shoe formations which require that body weight shift from leg to leg depending on the note being played. Leave enough space between the skirt of the pan and the performer to allow movement without contact being made. When moving the stick from one note to another, keep hands close to the playing surface. The sticks should appear to be gliding above the notes. This is essential to playing accurately and with speed. Keep elbows at or a little above waist level. The arms should be able to move freely over the tops of the pans without having to raise the shoulders or bend the elbows at more than a 45 degree angle. The technique for playing steel pan (steel drums) is basically the same for all members of the steel pan family. 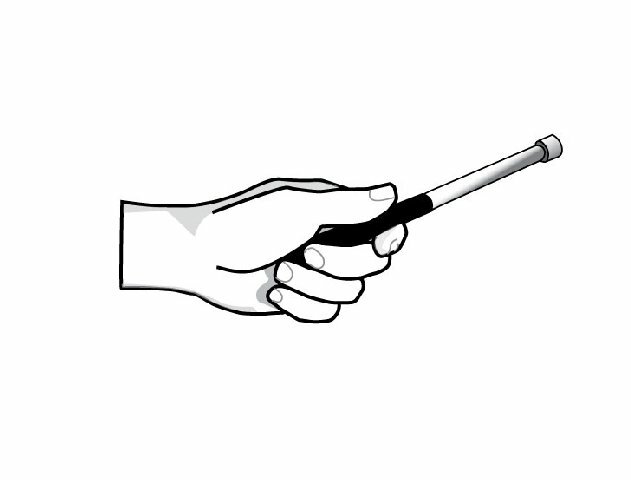 Pan sticks/mallets are held between the thumb and first joint of the index finger. The remaining fingers are then wrapped lightly around the shaft of the stick so that the finger tips gently touch the palm of the hand. No more than ½ inch of the unwrapped end of the stick should protrude below the little finger. The grip should be fairly loose but must get tighter when playing the smaller, higher pitched notes if the intensity of the sound is to be maintained. The sticks are held the same way in each hand i.e. in a matched grip position. The pan sticks are moved by the wrists. 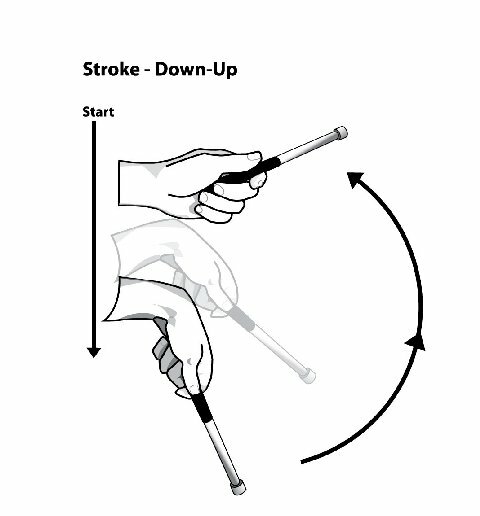 In both strokes, the stick must rebound back to the starting position immediately after impact. If not, a muted sound is produced. Using the wrist, lower the pan stick to strike the note and immediately return to the starting position. 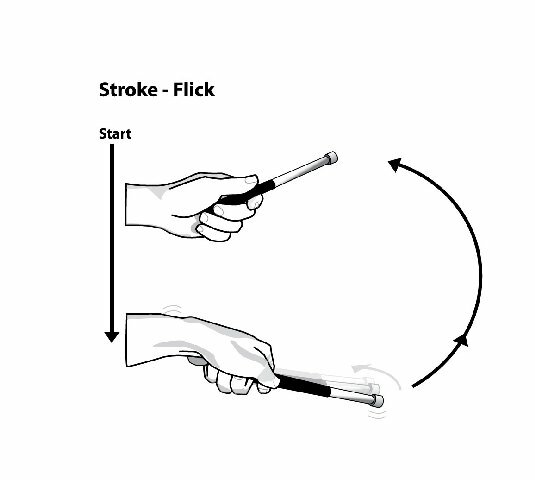 The ‘flick’ or ‘flicking’ is the movement of the wrist to the left or right. The single stroke roll is the technique used to sustain a tone on the steel pan. It is not unique to the steel pan. Many other percussion instruments use this roll as well. These strokes should be played evenly and quickly. Start slowly, making sure the roll is even, then gradually increase the speed. Either hand can initiate a roll. Pivot from the waist if you have difficulty accessing a note. The ability to roll quickly and evenly for extended periods is one of the hallmarks of a great pannist. Mastering this steel pan technique is a must for any serious pannist. A smooth roll will develop with time. However doing rolling exercises on a regular basis will help you achieve this goal faster.